India's emphatic win in Durban has set the tone for a high-voltage climax as the visitors go into the series-deciding third cricket Test against the Proteas in Cape Town on Sunday seeking to record their first-ever series triumph on South African soil. India, the world number one team, bounced back valiantly after an innings and 25 runs defeat in the first Test to level the series with an 87-run triumph in the second Test. What seemed like a doomed tour after their batting in the opening Test suddenly came alive with a fight back in Durban, setting the stage for what promises to be an electrifying contest between two sides battling it out for the number one position. The match is set to be played at a venue where India have never won, with a draw in 1993 being their best result. 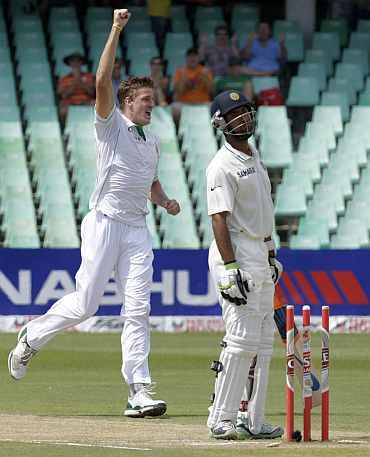 In all, India have played three Tests at the Newlands Cricket Ground and ended up on the losing side twice (by 282 runs in 1997 and by five wickets in 2007). But the morale-boosting triumph in Durban means that having history against them would hardly matter for Dhoni's men when they step on the field on Sunday. Most of the credit for the turnaround in India's fortunes goes to the return from injury of pace spearhead Zaheer Khan and middle-order batting mainstay VVS Laxman. In fact, in Durban, the 96-run second innings knock of Laxman and the six wickets by Zaheer were ultimately the decisive contributions in what was a topsy-turvy match. Zaheer's presence was especially inspiring for the rest of the Indian bowling and S Sreesanth and Ishant Sharma, both struggling in the opening Test, found their rhythm in Durban. 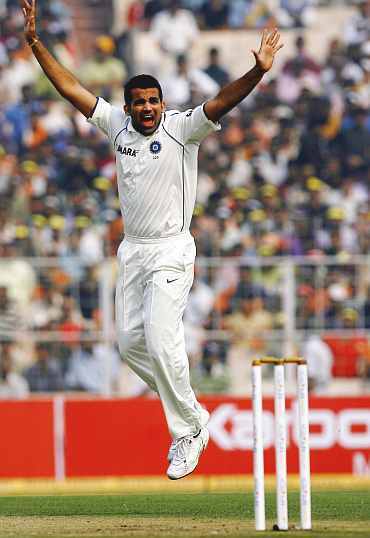 Sreesanth was particularly lethal in the second innings, grabbing three wickets. 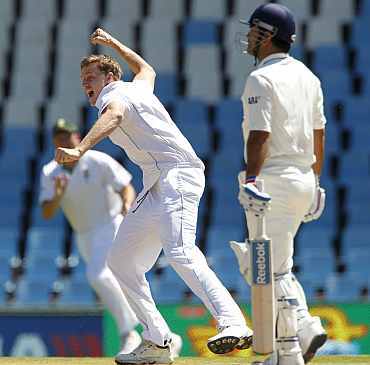 The batting, however, remains a bit of a concern as India collapsed in both the innings. Had it not been for some good bowling that dismissed the South Africans for 131 in the first innings, India could well have been in trouble due to their famed batting line-up's below-par show. Murali Vijay, who came in the side to replace an injured Gautam Gambhir, could not make use of the opportunity and would most definitely be out if the regular had recovered completely from the hand injury he sustained during a practice session before the second Test. Gambhir practiced with his team-mates at the net session on Friday and is likely to play the crucial match. Similar was the case of Cheteshwar Pujara, who came in for a woefully out of form Suresh Raina. With scores of 19 and 10, Pujara couldn't quite make an impression in the match but could still be persisted with. In the bowling department, Harbhajan Singh can be expected to have a bigger role as Newlands has traditionally favoured the spinners on the last two days. For the South Africans, the loss in Durban was a rude shock after the high of an imposing win in Centurion. But they can take heart from the fact that Newlands is a happy hunting ground for them. The Proteas have won 14 out of 21 Tests here and lost just three (against Australia). 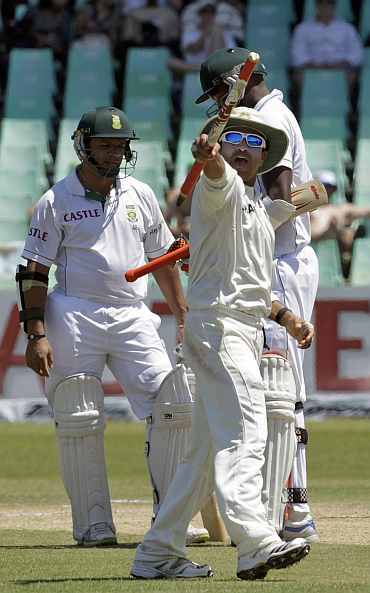 Graeme Smith's men, who pulled off a solid batting performance in the opening Test, couldn't quite click in Durban. The first innings was a disaster and even in the second innings, the batting was a let down. But the line-up is way too good to collapse too frequently and the Indians cannot afford to take it lightly due to the flop show in Durban. The likes of Hashim Amla, Jacques Kallis, Alviro Petersen and Smith himself cannot be expected to flop in unison continuously. 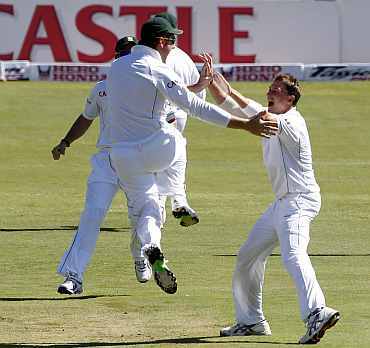 The Proteas have the better of the two bowling attacks with Dale Steyn's fiery pace being a major difference. The world's number one fast bowler in Tests has been in good form in the series and has consistently troubled Indian batsmen. He has been backed up well by Morne Morkel. The verbal volleys coming from players of both the sides continues to add colour to what has already been an engrossing contest on the field.